The original multimedia franchise has seen the good — and the bad — of that business model. In the spring of 2014, on the editor forum of one of the internet’s most comprehensive encyclopedias, a project was underway. Mere days before, more than 90 percent of the content on the wiki, representing almost a decade of work by tens of thousands of volunteers, had been rendered obsolete by the corporate parent of their favorite franchise. The question put to the wiki’s stewards was whether to delete these artifacts from the site — in which case they would inevitably find their way onto some other, less-noticed quadrant of the web — or to allow them to remain as a shrine to the stories and characters that had nourished a fanbase for decades but had now seen their last days pass by. The Star Wars Expanded Universe was dead. Time to prepare for what was to come next. But first, the matter of the archives. After several days of hand-wringing and politicking among the concerned, there was a vote. It was as unanimous as these things can be. The Star Wars universe so many had known for nearly four decades was to be relegated to a separate tab; a second vote later ensured that it would be secondary to the new canon, a new set of true and historical facts within a fictional universe. The stories adding color to the Battle of Endor or tales of how the Millennium Falcon became such a hunk of junk would be quarantined with the likes of fanfiction and unlicensed knockoffs. It was the most comprehensive structural change in the history of Wookieepedia, the Star Wars encyclopedia and the second-largest fan-maintained franchise Wikia on the internet.1 And although it was a painful process for many of the franchise’s most ardent fans, they may find some comfort in the knowledge that Star Wars wrote the book on franchising a universe, and the business plan it left behind all but ensures a universe just as lively and well-attended as the last — and eventually, just as much of a headache. This is the paradox of building a franchise: the urge to add complications and color outside the line is necessitated by the overwhelming earning power of the form and the demand from the fan community. But this same urge is what inevitably requires a scheduled burn-off, and there’s no better example of this than the Star Wars Universe, which has “Rogue One: A Star Wars Story” hitting theaters Friday. 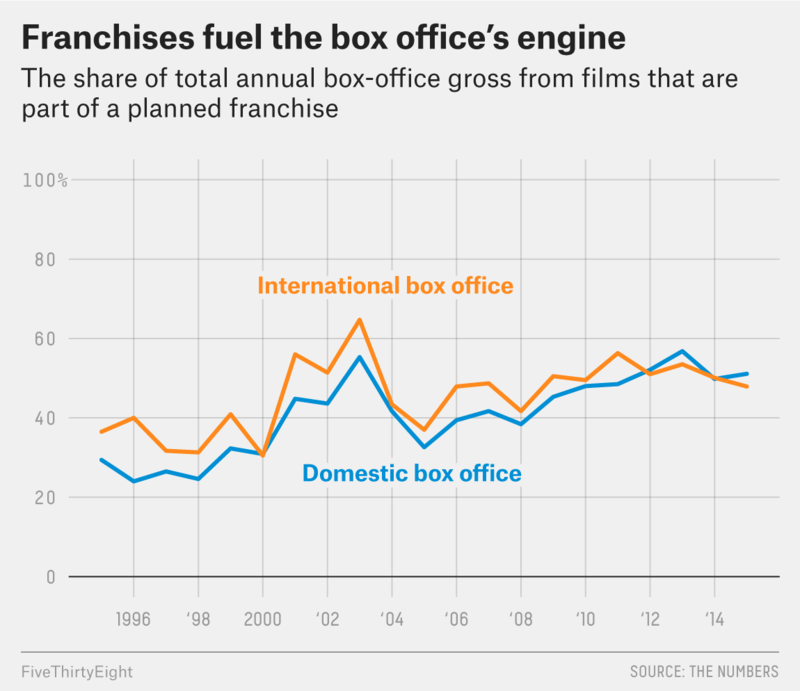 Today, we’re approaching the point where consistently half of all box-office revenue, domestic and international, comes from installments of a larger story — that is, from film franchises. Franchises have changed the way Hollywood tells stories and made everyone involved rich in the process. I pulled data on all the movies listed on The Numbers, a box-office tracking database, and whether they belong to a franchise. On the whole — domestically and internationally — market share for movies that are part of or beginning a franchise has been rising steadily over the past 20 years. In the five years from 2012 through 2016, at least one film was released in over 257 active franchises, from How to Train Your Dragon to Pokemon to James Bond to Bad Santa. Of course, although sequels are far from guaranteed money, studios are putting so much capital behind shared worlds for a reason. Taking all that into account, it’s a minor miracle that a handful of the earliest franchises have survived long enough to enjoy this boom time, particularly one that has suffered far more of the downsides to multimedia interactive storytelling than any other — namely, the Star Wars Universe. Star Wars laid the track for much of what we know about how to run a franchise. Lucasfilm was the first to say that the world it was building also lived outside the big screen and that any of the officially commissioned and licensed commodities that told stories in their world could be part of the official record — the canon — too. It wrangled not only films, but books, comics, video games and television shows into a solitary, persistent universe. And as a result, Star Wars ran headlong into all the advantages befitting a multimedia juggernaut — and all of the pitfalls. It would become a world where an extra in one movie can turn into a hero on the page and gain such notoriety that they get a shoutout in a later film. One where a well-designed character could catch George Lucas’s eye and get a promotion to prominent Jedi master. But it was also a world where a Jefferson Starship song was canonically a popular anthem of the Wookiee resistance on Kashyyyk during the Galactic Civil War, and where Obi-Wan Kenobi’s homeworld of Stewjon was a pun made on the “Daily Show with Jon Stewart,” and where “The Empire Strikes Back: The National Public Radio Dramatization” had John Lithgow play Yoda. It turns out that when supply meets obsessive demand, sometimes the obsessives win out. And as a result, the depth of material on Wookieepedia is astounding. “I think Star Wars was the first franchise to try to incorporate the expanded universe in a single canon,” said Alban Leloup, a longtime Wookieepedia contributor who’s one of the top-50 editors and as sanguine about the Wikia’s direction as old canon partisans come. That changed in 2014. Disney, the new owners of Lucasfilm, was looking to clear the deck when it came to canonical obligations ahead of the next several years of Star Wars movies. So the company decided to deem the vast majority of material created outside the main films as non-canon, termed “Legends” — thus spurring the furious debate at Wookieepedia about how to handle the decades of now-irrelevant material. As of Dec. 9. Numbers are rounded to the nearest hundred. “Longest Wikipedia article” refers to “electric car use by country,” which is the longest article in the online encyclopedia that is not a list. The stories weren’t wiped out entirely — the line has been “there’s always a little bit of truth in the Legends” — but many fans were apoplectic about Disney’s decision. And it’s easy to understand why: Two years on and Legends pages still outnumber now-canon pages 10 to one. As of Dec. 9. “Real-world articles” are articles on Wookieepedia about things in the real world — George Lucas, for example, or The Walt Disney Co. Disambiguation pages are navigational aids. More than half of canonical articles have a counterpart in the Legends continuity — many far more expansive. The Legends entry for Anakin Skywalker is 114,700 words long,3 more than twice the length of its now-canon counterpart. The canon article on the Galactic Civil War is a sixth of the size of the Legends article on it. Even where names and places remain, history can be lost. And yet, what choice was there but to begin again? Imagine the farce: You want to make a movie about what happened 20 years after “Return of the Jedi”? I hope that squares with the two dozen books on that decade. Want to tell a story about how the Death Star plans were stolen? Turns out they were stolen by nine different groups on nine different occasions in the EU. A rampant expanded universe is wonderful right up until the point it isn’t. Exactly when that point comes depends a lot on how carefully the plan was carried out. If everything goes according to plan, as it has for Dr. Who, a universe can exist unmolested for decades. But if plans go awry, the primacy of the franchise in modern storytelling — and storyselling — means the universe may need to be destroyed and rebuilt, as many times as it takes to get things right. For fans of characters popular enough to warrant their own franchise, this can be an anxious proposition. Disney is far from the only operation to decide that amputation is the best prognosis for a messy franchise. Just a few years before “The Force Awakens,” the Star Trek universe split its timeline and put its largest wiki, Memory Alpha, in the same predicament. 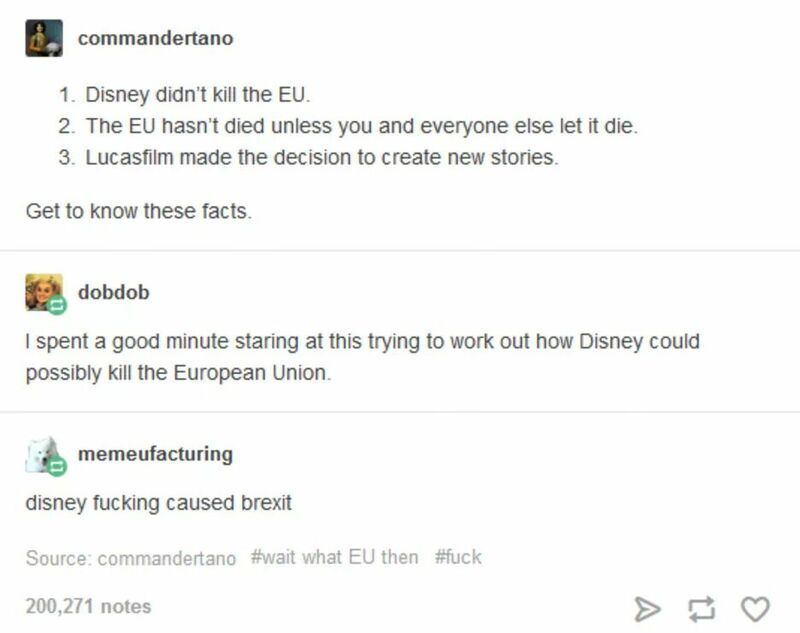 And it isn’t just the space operas that have had to deal. Comic books and their derivative films are lousy with continuity reverts: Marvel combined two comic universes into one and issued a broad soft-reboot to most books just last year, and DC seems to reboot its universe whenever the Flash takes a sick day. But while such prudence has proven wise for some properties, it’s difficult when placed alongside the animating impulse of franchises: the insatiable need for more. Before the advent of home video, the only way to see Star Wars was to go to a theater and see Star Wars. If you wanted to relive your favorite movie, the most cost-effective way to do so was to pick up the novelization of the movie or maybe dabble in some of the comic books created to tide fans over between “Star Wars” and “The Empire Strikes Back.” This paradigm would continue through the 1980s — derivative works designed to fulfill fans who could not rewatch the movie or who wanted to get a deeper look into the world and characters they love. Timothy Zahn changed that in 1991, with the first installment of the Thrawn trilogy of novels. This took the story past the end of “Return of the Jedi,” pushing the galaxy into the period of “slightly-more-recent-than-a long time ago in a galaxy far far away.” The trilogy was a hit, and the 1990s proved to be a renaissance period for Star Wars even though no actual movies were released until the end of the decade. By 1996 and 1997, Lucasfilm was trying out full multimedia releases, Leloup said. “Shadows of the Empire” was released as a book, comic, video game and soundtrack. It too was a huge hit. Then pre-production on “The Phantom Menace” — the first of the prequel trilogy — began. When the movie arrived on the scene in 1999, the Star Wars media empire was in the middle of one of the most frenzied paces of production the galaxy had seen since the ’80s. That only continued, as a throwaway line from “A New Hope” spawned an entire legion of stories about “The Clone Wars.” Lucas got his movies, sure. But what was built in the time since the original films — all the comic book deals and video game contracts and toy rights and television development experience — was poured into the fully operational battlestation of a new trilogy. 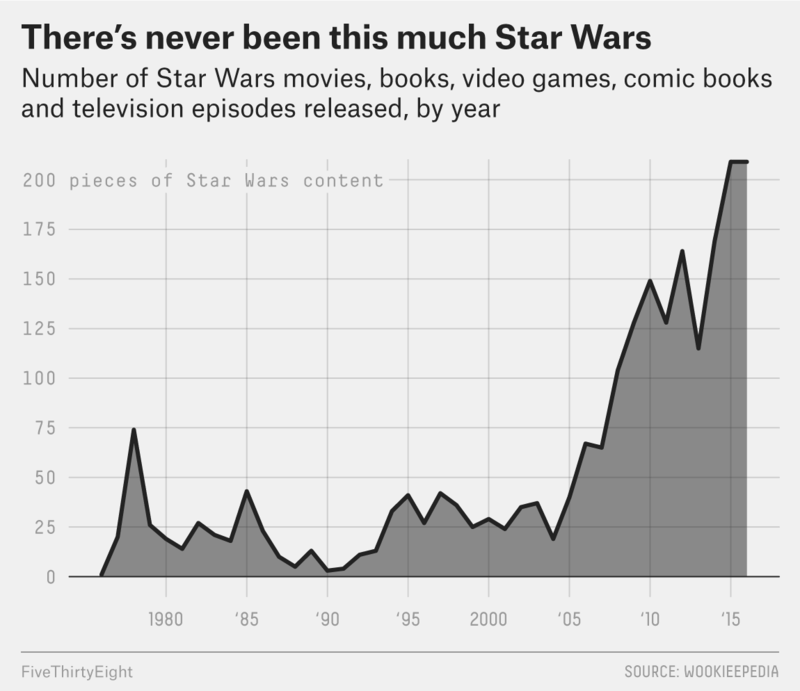 And that led to a stunning rise in the annual production of War materiel, such as annual PC and console games, popular cartoons about the Clone Wars, and novelizations of anything with two legs and access to a lightsaber. Which leads us to the Disney acquisition, the ending of the Expanded Universe, and a return to the simple times. The era of every last background character’s getting his or her own convoluted backstory is now a long time ago in a galaxy — hahahaha just kidding, fat chance. There has never been as much Star Wars stuff in the world as there is right now, post-acquisition, and the canon is back to growing at a quick clip. Just after “The Force Awakens” came out last year, we were given extensive histories about, say, FN-2199, aka the guy who yelled “traitor” at Finn that one time. A random cantina dweller once again has a degree of pathos added to their history. A cool-looking guy you did not remember but was definitely in the movie turned out to be the best pirate in the tri-county area and captured “the lost treasure of Count Dooku.” Performances that barely merited making scale are once again commanding sizable backstories. It’s all happening again. Leloup, though firmly in the Legends camp, is looking forward to “Rogue One,” but for a different set of reasons than most fans have. He’s interested in those rank designations worn by Imperial officers and wants to see how the film squares those with inconsistencies seen later in the original trilogy. He hopes it can settle a longstanding question about the world he loves. Wikias are encyclopedias that are built and maintained by fans and are run by Fandom, a company started by Wikipedia co-founder Jimmy Wales. Hell, you could have Molly Brown be your Phil Coulson. Word and article counts were conducted on Dec. 9.